Update: This restaurant is now in soft opening! See full Via Napoli menu here. 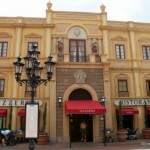 Thanks to Pam Brandon and the Disney Parks Blog, we now know that Via Napoli will be opening early — next month! 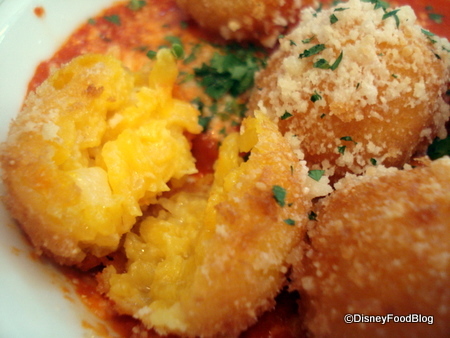 — and we have a good idea of the menu for the upcoming Via Napoli in Epcot’s Italy pavilion! The Wood-fired pizzas, which is what Disney is hoping the restaurant is known for, will be made with caputo flour imported from Southern Italy, San Marzano tomatoes, handmade mozzarella, and water from a local spring just like in Italy’s Campania region. The 10-inch, 20-inch or 1/2 meter-sized pies will come in a dozen choices, from a simple pizza Margherita with tomato, mozzarella and basil to carciofi with artichoke, potato, pecorino cheese, prosciutto and cantaloupe. Also available will be Piatti alla Parmigiana, which are dishes topped with Parmesan and mozzarella gratinée. These will include veal, chicken, and eggplant. The pictures I’ve linked to in this post are what we sampled at Naples in Disneyland, a restaurant also run by The Patina Group. You can see the full review of Naples here. To see more of our coverage of Via Napoli, along with specifics about the restaurant’s interior decor, three massive pizza ovens, and more, check out this page for links. 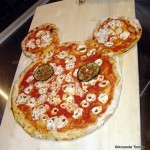 As always, check out the Disney Parks Blog for further info on Via Napoli. Early opening means we will be able to try this out!! Why did I read this review before lunch? I am drooling over my keyboard now. Those fried saffron risotto balls look like they are to die for! I can’t wait to try this place. My next trip to Disney can’t come soon enough. BigDaddy — Great news! I can’t wait to hear your review! JulFromMD — Not sure about TiW. I imagine that, like Tutto Italia, it will eventually be on the TiW list, but I don’t know how long it will take. Liz — The arancini is delicious 🙂 When IS your next trip to Disney? Do you have any idea when Disney will let us start making ADR’s for it? We’re going in Sept. and we would love to go here!!!! Called WDW Dining to ask about ADRs at Via Napoli. CM had to ask her supervisor. Supervisor isn’t sure, but guesses within 1 or 2 weeks they will start excepting ADRs. I’ve never heard of cantaloupe on a pizza. That’s a new one for me. Amy — Not sure yet! Disney said July or August, but since it’s opening in August, my guess would be sooner. Looks like Scott B has some info from the horse’s mouth. Griffin — Wha?!? I’m making you go get pizza. That’s that. So. Excited. So. So. Excited. P.S. Prosciutto and cantaloupe sound like an amazing pairing for pizza topping. You’d be surprised at what foods pair together really well. Any news on if there will be a counter/quick service option available at this location??? Either way – I can’t wait to try this restaurant! Arancini & Zeppole – here I come!!! And if the Gelato is really Gelato – I’ll be in heaven! I just tried to make an ADR online, but it’s not taking reservations yet. Called just to double-check. Nothing. Boo. 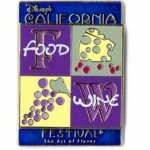 I’m going to have to start stalking Disney dining reservations. If I hear anything, I’ll let you know (although let’s be honest, you are you and you’ll probably know before me). These are some odd food combinations but what else do you expect from a place being set in Epcot’s Italy pavilion. I am a linguine fan myself, and the seafood linguine does sounds like an interesting new combination! The post says 20 inch OR 1/2 meter pies. 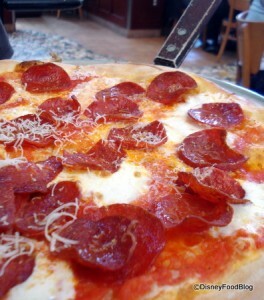 The other Patina group restaurants have 10 or 20 inch pizzas. Think it’s just the two options. Great menu. Having recently been to Italy, it sounds like they really nailed the authenticity too. However, I still am unclear if any component of this menu is Quick Service or if it’s Table. This is a lot fancier than the typical QS which has me thinking they may do something similar to the Hacienda and have some parts be QS and others Table. I really don’t have any Table options left for my Oct trip and was hoping to pop in during lunch time to check it out. I know that I have complained about the price point at this place, but if the pizza is as good as it looks, it will be money well spent! I’d use a CS credit on this, but as others have said, I’ve already booked all my TS restaurants for my stay which is next month! Would love to try some, those pies look sooo good! I sincerely hope they have some meatless arincini. 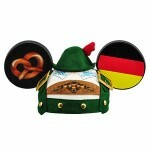 If so, between this place and Germany I may never leave EPCOT.